It was a rude awakening. I was 26 years old and in a very bad marriage. My weight dropped to 85 pounds and my doctor said if I got sick I was not likely to not recover. One day driving home from the school where I taught I heard the song “Fifty Ways to Leave Your Lover.” At the next confrontation with my husband, I gathered my courage and was gone, taking only my car. What a feeling came over me—Freedom! Something changed drastically that day. While I was frightened of everything, I had a dream. 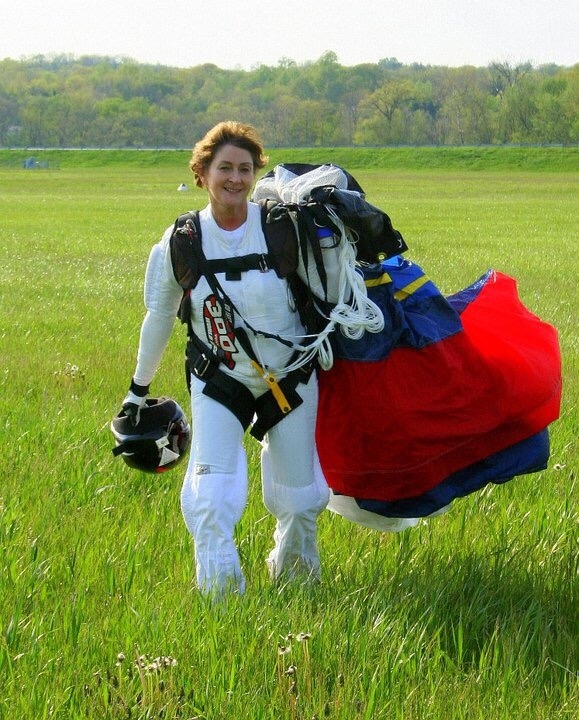 I wanted to make a parachute jump—and I did. I was so afraid to skydive, I literally took myself to the drop zone and ignored my fear. By the 5th jump, I pulled my own rip chord and saved my life. 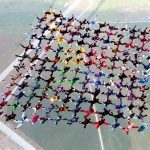 After five years I had my first World Record, 32 women hooking up in the air. I was one of four Americans invited to the first 100-Way Women’s World Record. Diving last out of the airplane came easy. The highlight of thee women’s dive I achieved was the ” Jump for the Cause” where 136 women raised nearly a million dollars for cancer. My first 100-way was in France and took a week to complete; it felt like going to girl scout camp all over again. I also did a 120-way out of a C130, the first 144- way diamond formation, the 300-way out of MI 26 Helicopters in Russia (three people short) and the successful 300-way in Arizona. Overall I’ve done 2500 dives, earned my pilot’s license and broken 14 World Record Skydives. Now I’m retired from teaching and my last jumps were SOS jumps in California. We’d love to have you join the conversation. Please comment below—you never know who you might inspire or where it might lead. Wow! Great story and pics! Thanks for visiting Nancy. My thoughts exactly! Sounds great Sierra! Best of luck with your next move. What you focus on expands. That is one heck of a life changing epiphany!! Go big or go home!!!! Truly inspiring and makes me want to do something epic!! What an inspiring story! Just reaffirms that we all have the ability to face our fears and access our power to achieve whatever we want. Way to go! Well said Denise—we can all use these affirmations from time to time. And what an image to conjure up, Kretz jumping out of the plane, when at first what we might want to achieve seems unsurmountable. Thank for your comment and also for the inspiration you give and have given to so many. Great story Kretz!! You rock! Thanks for the introduction Dennis! Great story, Kretz … you rock! Thanks Dennis it’s been a wild ride!. When you put your mind to something, the rest falls into place. Remarkable story! Go for it , Sierra, and rememberr that everybody’s scared . Some just don’t let it show . You have always been an inspiration Aunt Linda!!!! Thanks for stopping by BK. She has inspired many. If you’d like to share any of your own “Brave Books,” or Words of Wisdom,” or if you have a nomination for more “Gutsy Goddesses” we love to hear from you. I’m also starting to compile songs, art and poems that inspire. Thanks BK. I wish I could surf like you! You made me a fearless, strong, and independent woman! I love you, Mom! I’m glad you get to share your inspirational story with the world! The Woman. The Myth. The Legend. The Kretz! Wow! What an amazing story. You truly are a gutsy goddess! Thanks Lynn That means a lot to me. I don’t always feel lifeless very gutsy. Kretz, you are and have always been an incredible person. Thanks for being an inspiration in my life 20+ years ago. Haven’t yet jumped out of a plane but I’ll always have a special place in my heart for skydiving thanks to that summer with Chris and Maddi. John, I don’t know how I missed your comment earlier, but thanks so much for leaving it. Glad that you have found inspiration as I have. 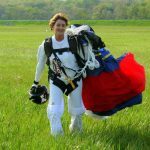 When you wrote, “haven’t jumped out of a plane yet” I thought ‘what’s stopping you.’ Then I thought, ‘I haven’t either.’ Maybe not for everyone but an amazing way to think about a challenge. You’re a gutsy goodess alright! More power to you. So glad you stopped by Corinne! As a blogger who “believes in encouraging growth in others,” and with your interesting past, I’m wondering if you might have a favorite quote you might be willing to share or a Gutsy Goddess you might recommend. Either way—Welcome to The Tribe! Keep pushing the envelop otherwise you will be confined by your own self doubt. Empathy, inner peace and happiness are obtainable goals. Reconciling one’s past so that it doesn’t interfere with one’s present is another goal. Good luck with your lifetime adventure. John—thanks for the insight and inspiration. Not easy yet very true. So glad you could stop by. I hope you come back again. Thanks, John Haggstrom . Your words have hit the mark. Thankyou for your wisdom. I will remember it always. Wow a truly inspiring story! Hi Marian, Thanks for the comment. Glad you are inspired! What an incredible story! I love these kinds of things . . . we don’t have to be unhappy and paralyzed where we are. Thanks Lynda. So glad you stopped by. I believe you have your own “incredible story.” I hope you will con side filling out the Gutsy Goddess questionnaire on the About page. Lovely story. It’s good to hear how you can change your life and that of others through going with your heart. “Going with your heart,” what a great phrase. Thanks so much Fiona for stopping by, and welcome to our community! Such an inspiring story! Kudos to anyone who does skydiving. It looks such an awesome experience but I’m too much of a wuss! Welome to our community! Thank you so much for commenting, and also for the inspiration and thoughtful insight that you bring to your blog…supporting us as we all “search for our own truth.” And somehow, I can’t picture you as a “wuss,” but more as a Gutsy Goddess too. Rachel thanks so much for your comment. Welcome to our community. Glad you found her story inspiring as did I. It is amazing when someone can turn around something “very bad” and make it so strong and powerful for good. Thank you so much. Like you, I appreciate community and welcome you to ours. As a sailor I have found myself on a small boat in the middle, literally, of a vast ocean, feeling small and alone. And then there are times on land when I find profound connections to people from so may parts of the world. I look forward to reading more from you. I hope you will feel welcome to return on your journey. Thanks so much for stopping by Lauren and for your comment. You have put forth such inspiration too and have helped me today to ramp up my gratitude. I hope you will continue to stop by our community. Wow! That is truly inspiring! Thanks for leaving a comment. Glad you found inspiration, so did I! Wow! Awesome story. I’m so proud of her for getting out of a bad marriage! Lisa, thanks so much for your comment! I agree, quite the awesome woman! Wow! Well done you! That is as inspirational as it is amazing! Welcome to our community Sonia! I’m glad you found inspiration. I think she’s amazing too. I can hardly imagine free falling like she does. Thanks for your comment, and for stopping by. Oh my….I just love when you know you’ve had enough and that you deserve more…This is such an inspiring story…. Welcome to our community Phaytea. I’m so glad you found the story inspiring, as did I. Thanks for leaving a comment. You followed your dream and that is courageous. Ha—Your comment “Go Kretz! !” brought a smile to my face. Thanks for stopping by Simonne. She is a courageous woman and an inspiration to many. So glad you were inspired Kerry, and thanks for joining the conversation! Great story! I appreciated the inspiration. Welcome to our community, Kim. Isn’t it great?! Glad you appreciated the inspiration. I see her upside down and just feel amazed. Glad you were inspired Susan, and thanks for the comment. Sorry I missed your comment earlier. Welcome to the site. So glad you found it inspiring as did I, and thanks for joining the conversation. I recently saw Kretz and she was as inspiring and exciting as ever. May we all have her courage! Great to see you in NJ. Thanks again for the inspiration. May we all have your courage and enthusiasm for life. Safe Jumping!!! Wow! You found the 51st way and turned it into a great success. What a great story! You are an amazing person, Kretz! Haha Clemens, you have me singing the song with “Hop out the plane Kretz.” Welcome to the community and thanks for joining the conversation. Finding your inspiring story here at Heidi’s Gutsy Goddess. Face the fears and do something about a marriage making you sick. Big life move, big step to being your own goddess. Good for you. Enjoyed seeing that your daughter is your biggest fan. Thanks for joining the conversation. Glad you found inspiration as did I. I just saw Kretz recently on a sailing trip and she was heading out again, Inspiring, jumping, and flying; she’s earned her pilot’s license! This is amazing. It also makes me want to try jumping out of a plane(!) That is not something I expected to type when i woke up this morning!! Greetings Josy. So glad you dropped by. I was just checking out your blog and the photo of you in New Zealand at Bob”s Peak looks like you’re ready to go, or to jump! Anyway, great to meet you and welcome to the tribe! So inspirational! Thank you for sharing your story! Hi Taylor, Welcome to our tribe and thanks for the comment. Glad you found it inspiring, as did I. I once had a minor office visit that I was nervous about and I thought well if Kretz can jump out of a plane I can do this interview. Anyway, nice to meet you! This is so unbelievable, inspirational and what an example for us all. Kudos to you and all the other strong and incredible women out there. 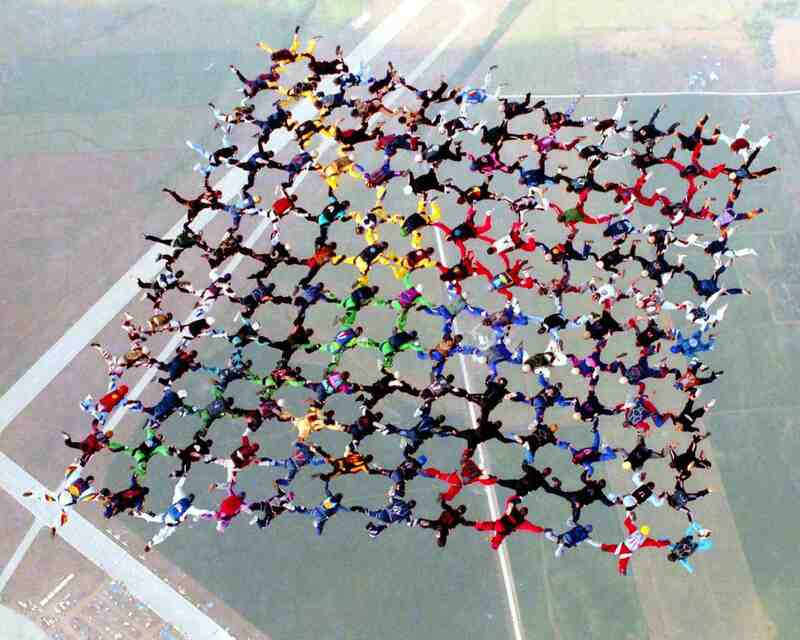 We have done a lot of small plane flying but never skydiving. May have to reconsider this and try it. Thanks Esme. Kretz is quite the inspiration. I spoke to her a few months ago and she was still going strong. Please let me know if you do try! Truly inspirational. We let our fears stop us from experiencing life fully. We fa fail to pursue a dream, stay in a bad marriage while fear holds us hostage. You show that facing your fear head-on is the way to live fulfilled. Thanks! Welcome to the tribe Jane and thanks so much for your words of wisdom. I too was once stuck in an abusive relationship; it took many months of hard work and therapy to understand the fear, and leave, yet doing so improved so much in my life and for those I love. It’s so true that facing your fears head-on leads toward a life fulfilled. I how you continue to share your wisdom, and again thanks.